I have been trying to figure out a bit more about the sensitivity problem described in part 3. This is the part 3 on my series about my HP 8662A Signal Generator, and is about the third main problems I found with this unit, as evocated in part 2: Error 04 is lit and there are some very unpleasant spectrums at some frequencies. Thanks to HighPrecision, I've been able to get a copy of an old version of the EIP documentation "Additional Service Information for 5XX CW Counters". It's unfortunately unavailable online, still, it contains a lot of valuable information. This part is about my attempt to modify the firmware to "fix" the problem of weird intial setup: a -160MHz offset and a resolution set to 5 digits. In the previous part, we figured some probable spots in the firware where these default setup configurations might be set. I've started a discussion on the eevblog forum to gather a bit help for my project. And I did well since a few fellows did help me a lot on some aspects. 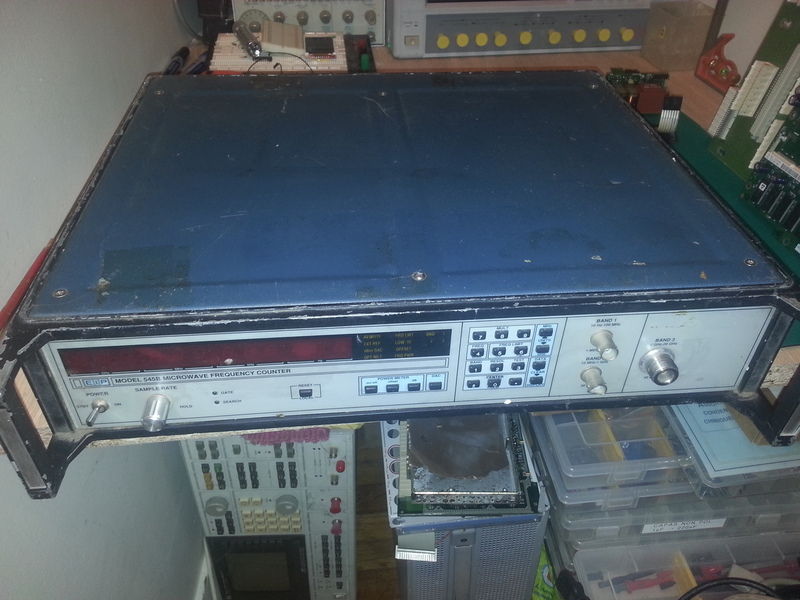 I recently purchased a broken EIP 545B microwave frequency counter on ebay. It was very inexpensive (around 150€ delivered), but obviously, non working. A friend of mine had a problem with his (a bit old) 24" HP monitor: the device was working properly, but only for a while (few minutes at most). Looked like a good candidate for a quick repair, problem being most probably bad caps are so. This site uses a customized version of the bricks pelican theme.